Every year, Free Comic Book Day grows by leaps and bounds. What started as just a few comic companies giving out a handful of comics has transformed into over 15 companies and 50+ comics! With many stores implementing strict limits on just how many books you can pick up, you need to make every choice count. 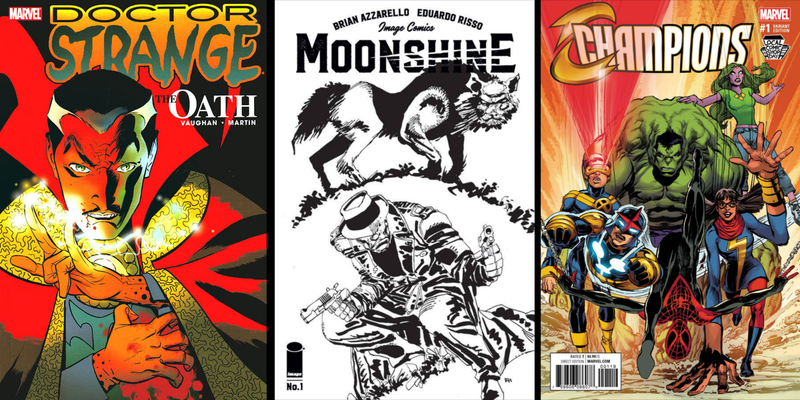 Luckily, your friends at TFAW have come through with a list of the 10 comics you need to grab this Free Comic Book Day. Why 10? Because that just happens to be the number of comics we generously give at each of our retail locations. Want to visit your Local Comic Shop? Visit ComicShopLocator.com to find your nearest Comic Book Store! Things From Another World is excited to be taking part in the second annual Local Comic Shop Day (LCSD) on Saturday November 19th, and we’re doing what no other comic shop is doing: giving away three Limited Edition Saga Lying Cat Statues! 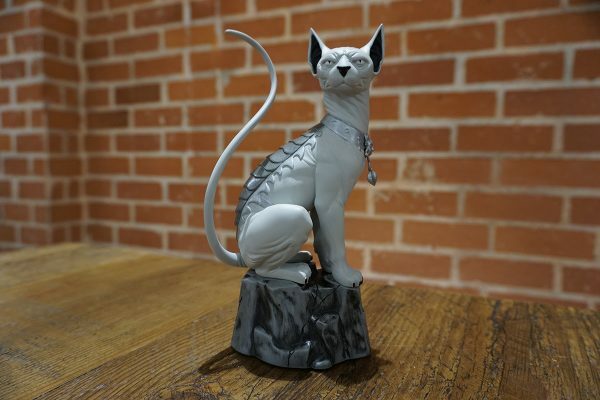 We will be giving away one of the Local Comic Shop Day Exclusive Lying Cat Statues from the hit series, Saga! Only 300 of these were made, and each one of our Portland/Metro stores is giving one away. So how can you get one? Just come to one of our Portland Area stores anytime during business hours (11 a.m. – 7 p.m.) on Local Comic Shop Day, Saturday, November 19th. Each store will draw a winner from applicable entries and will announce the winner via the store’s email newsletter on November 21. No purchase required, but feel free to check out thousands of other amazing products in our store, including other Local Comic Shop Day exclusive items like the Exclusive Hardcover of Doctor Strange: The Oath from Saga writer Brian K. Vaughn, Neal Adams’ Champions #1 cover, and the highly sought after Moonshine #1 (Frank Miller Variant Cover). All of these are limited in quantities so make sure you stop by early! Local Comic Shop Day is all about showing support for the comic shops in your area, but we wanted to go a step further and show our gratitude to the many great customers that make each of our Things From Another World comic shops such a special place. So come on down November 19th for your chance to win this limited and exclusive statue! We’re excited to announce that we are hosting writer Chris Roberson for a special Serenity: No Power in the Verse comic book signing from 6-8PM on October 26th at our Portland Things From Another World comic book shop. We’ve also partnered with the PDX Browncoats and the Oregon Food Bank, and are inviting the community to help us support a great cause. Beginning October 12, and running through October 26, we’ll be collecting nonperishable food items that will go toward supporting the Oregon Food Bank and the Oregonians who depend on its ongoing efforts. Beyond the great feeling you’ll get by donating to an awesome cause, we’ll also give you a raffle ticket for each item you bring in from October 12-26. 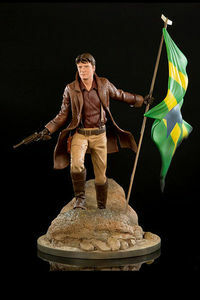 TFAW will be giving away a Serenity Malcolm Reynolds 1:6 Scale Statue (pictured here) valued at $249.99–it’s sure to become the centerpiece for your Firefly/Serenity collection. Chris Roberson will be picking a raffle winner at the Serenity: No Power in the Verse signing on 10/26. Winner does not need to be present to win (though it would be more exciting for everyone if they are). We invite you to join us at the Portland TFAW on Wednesday October 26 as we celebrate the launch of the newest serenity series, Serenity: No Power in the Verse, written by iZombie co-creator and all-around awesome guy, Chris Roberson. We’ll be kicking off the event with a Q&A with Roberson, followed by the raffle winner announcement and a comic book signing. The Verse is a complicated and dangerous place, and Mal Reynolds and his outlaw crew aboard the Serenity are experiencing tough times. When tensions rise among the crew, a call for help becomes a welcome interruption: they must track down a missing friend and the answers to the mystery surrounding her disappearance. 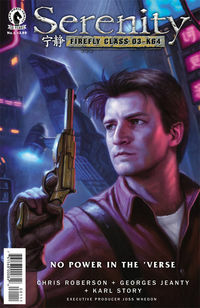 The six-issue comic book miniseries is published by Dark Horse comics and written by Chris Roberson (iZombie, Hellboy) with art by Georges Jeanty (Buffy Season Eight), Karl Story (Nightwing, Tom Strong), and Wes Dzioba (Aliens, Star Wars Invasion). Can’t make it to the signing at our Portland, Oregon store? Order your Serenity: No Power in the Verse comics and get them shipped to your door. Join us at our Oregon Things From Another World locations as we celebrate Batman’s enduring legacy with generations of fans during Batman Day on Saturday, September 17 from 11AM – 7PM. Stop by the shop to get 10% savings on Batman graphic novels (including Robin, Batgirl, Batwoman, Nightwing, Joker, Harley Quinn and more) and select Batman merchandise. Special 20% savings on some of our favorite Batman graphic novels! For those of you who can’t make it to our local stores, we’ll be offering special Batman Day savings at TFAW.com on Saturday, September 17th as well! Do you want to display your Batman art at your local Oregon TFAW store? What about online? We’re looking to showcase awesome Bat-Art for Batman Day September 17th. Drop of a copy of your art at any one of our local TFAW stores by Sepbember 16th. Don’t live nearby? Email your art to (jpg format no bigger than 1200px) to social@tfaw.com to have it showcased here in our blog! Be sure to include contact information (website, social media profiles, deviantArt page etc)! Then, stop by the shop or come to the TFAW Blog to see your artwork, along with dozens of other submissions! Want to meet the Dark Knight himself? Come by Portland Things From Another World from 11AM – 1PM and get your photo taken with Batman and Batgirl! Think you know the most about Batman? Come prove it. We’ve partnered with our friends at The Beer Store Milwaukie to bring you a special Batman Edition of Geek Trivia from 8-10PM September 17th! Located just two blocks North of our Milwaukie Things From Another World location at the Beer Store Milwaukie for a pub-style trivia event complete with prizes. We’ll see you September 17th for Batman Day! If you’re heading to San Diego Comic-Con then congrats, you’re in for an amazing few days jam packed with comics, fantasy, scifi, movies, TV series, cosplay and so much more. In fact, you’re going to be exhausted by the end of SDCC. How do we know? Because we go every year and it’s awesome! As we’ve done in previous years, TFAW is also going to have a booth where we’ll be selling all sorts of super cool stuff, including SDCC exclusives, Lightsaber lights, board games and more. You do not want to miss what we’ll be offering! Now you know how to find us, here’s why you’ll want to stop by and pay us a visit! You’ll get all 4 issues bagged and boarded for $18.46. 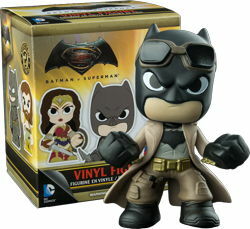 Check out these awesome new Catwoman and Wonder Woman Noir Bombshell vinyl figures $29.99 each. Hint: Save $15 when you buy both at SDCC! We’ll also have a huge range of Funko pops at the great price of $10 each. But we’ve got so much more to help you grow your collection, whether you’re into comic books, graphic novels, figures or just about anything else from the fan universe. Graphic novels? We’ll have them at 25% to 50% off the cover price! Mystery Deadpool Keyings will also be available! Tell us you don’t want one right this very second! Don’t tell anyone but I’m a huge fan of the Tsum Tsum Tigger! With all our Mystery Blind Boxes and Keyrings at SDCC from Funko and more, if you don’t like who you get, we’ll trade you with one we have on display! Yup, she’ll be at our booth at San Diego Comic-Con too Booth 5625. Please, stop by, check out what we’ve got, and most of all enjoy Comic-Con. We certainly will! Sure you can read the comic books, graphic novels and other work of our favorite artists, but how often do you get to meet ’em in person and watch them create some of their amazing works? Fortunately there are ‘Cons and this weekend is Denver Comic-Con in the Mile High City. Are they all famous with massive followings and dozens of comics here in the TFAW catalog? Not all of them. Not yet. But they’re all remarkably talented and it’s a treat to see ’em at work. Here are just some of the artists I bumped into, hard at work on their next masterpieces. Javier Avila, hard at work on one of his pieces. We’ll forgive him being a Chelsea fan! Steve Oatney doing one of his many quick pencil sketches. The talented DIHA working on one of her many portraiture sketches. And +1 for hair color too! reference art on his iPad in the foreground. The talented Matt Haley, who we’ve interviewed for TFAW! Old school comic book art and an astonishing portfolio from legend Jose Delbo. Brett Morgan working on a piece. Note his iPhone showing reference art for the picture. Really liked the pieces from Brett Nienburg, including this very complex sketch he was finishing up. Julia Reck finishing up one of her sketches. Note the cheery tablecloth too! Kevin Taylor, who not only was finishing up a great sketch, but was enjoying the process too! One thing that also struck me as I explore the over 300 artists exhibiting in Artist Valley at Denver Comic-Con 2016 was the impressive diversity of the artists in race, gender, age and just about any other dimension you’d care to measure. It’s been a long journey to get here, but it’s wonderful to see such a diverse set of artists sharing their works great and up-and-coming! Things From Another World is excited to announce that we will be exhibiting during Emerald City Comicon at the Washington State Convention Center in Seattle, Washington April 7th through 10th! We are bringing an exciting selection of products with us to ECCC, so be sure to stop by booth #302 as soon as the show opens each day as new items will be stocked every morning. As always, you can expect to find fantastic graphic novels at 50% off savings, but we’re also bringing a great selection of POP! vinyl figures, Lego sets, blind box mystery mini figures, the highly limited Mighty Morphin Power Rangers #1 TFAW Exclusive Variant, and some other great products. We’re also excited to introduce our Blind Box Figure Exchange to ECCC. Half the fun about these little figures is the surprise of what you’ll unwrap. Purchase a figure at our ECCC booth, and if you end up with a figure that’s already part of your collection, you can swap it out with the figure in our display from the same line. We introduced this exchange at a convention last year, and people loved it! The TFAW Booth #302 is located just inside the entrance, so be sure to mark it as your first stop at the con to check out ECCC exclusive deals and have the best selection of graphic novels, toys, and collectibles! Be sure to follow us on Twitter, Instagram, and Facebook to get the inside scoop on what’s happening at the TFAW booth during this year’s ECCC! The Dark Knight vs. The Man of Steel! In anticipation of the “Batman v Superman: Dawn of Justice” movie, we asked the TFAW employees to share who they thought would take the trophy in a battle royale between these two iconic superheroes. The best submission not only gets to share their thoughts here on our blog, but also wins a great prize pack featuring some super swag from both heroes. Congratulations Ally Wilson for giving us a great run down on this epic match up of who you think would win and why. Bats are black, the last son of Krypton is blue, but when placed side by side, how do you chose between the two? With the opening night of “Batman v Superman: Dawn of Justice” so near on the horizon, more and more attention is being given to my two favorite comic heroes. (And rightfully so!) From super strength and speed, to gizmos, gadgets and guile, these two characters rule the DC Universe in both power and popularity. While both Batman and Superman are amazing characters, I have to admit that I have been addicted to Superman for pretty much as long as I can remember. One of my most prominent memories as a child is actually when I first saw the Superman movie, where I simultaneously fell promptly in love with the character of Superman, AND wanted to be Superman myself. After climbing atop my kitchen play set in the basement to see if I too could fly, my dream (and my face) quickly came crashing to the ground. While I was disappointed that I was not in fact Kryptonian myself, I at least had a brand new universe full of amazing stories and characters to dive into and explore. It wasn’t long until I started reading older “Worlds Finest” issues pairing the black bat with our man in blue, and was able to truly appreciate both characters as individuals, as well as the wonderful juxtaposition of the complimenting/contrasting nature between the two as a team. But, if it really came down to it, who would win in a fight, Batman or Superman? This is an age old question, right up there with “Kirk vs Picard” or “Who shot first?”, that is still as fiercely debated now as it was over 75 years ago, when the beloved Caped Crusader first earned his way onto the pages of his own ongoing comic series, and our hearts. But, is this even a question worth asking? Considering my Superman obsession, and the obviously uneven physical aspects of the two characters, I think the winner here is pretty obvious…. If the question at hand is between Batman and Superman, then their respective powers and skills don’t even really enter the equation. Sure, Superman could destroy Batman without even breaking a sweat (do Kryptonians sweat? ), but the real question to ask, is would he? Superman has spent his life using his abilities to help those in need, and knows that having the advantage against someone doesn’t give you the right to take advantage of your gifts against a weaker target just because you can. When all is said and done, even with all of the weapons and abilities at their disposal, the real determining factor of the fight would be simple morals and values; giving Batman the only advantage he really needs to win. While the Big Blue Boy Scout may not be the winner of a no holds barred Batman v Superman beat down, he has most certainly won fan girl status from me for the simple fact that he could rule the world with an iron a steel fist if he was so inclined, and yet he is constantly striving to be more ‘human’ than the levels of humanity most of us mere mortals choose to display. Ally Wilson is a full-time manager here at TFAW, and a part-time freelance writer with dreams of getting her own nerdy blog up and running. Things From Another World is excited to host local writer Ken Lizzi for a signing of his new sci-fi novel, Under Strange Suns, December 16th from 5:00 p.m. to 7:00 p.m. at the Portland TFAW! In the future, a terrorist attack has left the Earth in a state of constant war, and mankind is emigrating to the stars. When the inventor of the faster-than-light drive goes missing, his niece enlists a battle-hardened soldier to find him. Special Forces soldier Aidan Carson is tired of fighting, but the offer to join the search gives him a chance at a fresh start. Carson soon learns there is nothing new Under Strange Suns. Ken Lizzi is the author of the Portland-set sci-fi novel, Reunion, as well as an assortment of published short stories. He lives in Portland with his wife, Isa, and daughter. When not traveling, he enjoys reading, homebrewing, and working on his latest novel. Be sure to visit the Portland TFAW on Wednesday, December 16th from 5:00 p.m. to 7:00 p.m. to meet Ken and get a signed copy of his exciting new sci-fi novel! Be sure to RSVP on Facebook! Synchronize your watches! The savings are coming back to Things From Another World with our annual Black Friday Sale. Start your geeky holiday shopping early with a Biff Bang Pow! You won’t believe the awesome deals we have for you this year. We are kicking off our popular progressive sale on November 20th with 50% savings on thousands of comics, graphic novels, statues, toys, and other collectibles. On November 24th, the discount will increase to 60% on remaining sale items. The savings will culminate on Black Friday, November 27th, with 70% off and two waves of doorbusters–one at midnight and one at noon. Cyber Monday, November 30th, we’ll hit you with three more waves of awesome deals to end the sale! Plus, during our Black Friday Sale, you will get free domestic shipping on all in-stock orders containing $45 or more of comics and graphic novels! While the savings will increase as the sale continues, don’t wait to place your order–stock is limited, and someone else will steal these deals out from under you if you don’t act fast. Be sure to shop our incredible Black Friday Sale at TFAW.com, starting on Friday, November 20th and continuing through Cyber Monday, November 30th. Be sure to RSVP on Facebook so you’ll get a reminder you about the event! Before our stores open on Black Friday, November 27th, we are holding a special VIP event for our subscription box customers. This event is by invitation only. Be sure to empty your subscription box in November to get the invitation. We are opening our doors early at 9 a.m. on Black Friday to make sure you have plenty of time to save 20-80% on most products throughout the store! (Savings don’t apply to statues, collectibles or other non-discountable items. Deals and stock differ from store to store and online at TFAW.com.) These deals begin on Friday, November 27th, and continue while supplies last through Sunday, November 29th. If you are looking for even bigger savings, check out our selection of doorbuster deals and manager’s specials. Whether you are a fan of Star Wars, Batman, Spider-Man, or classic Dark Horse/Marvel/DC tales, we’ve got a deal just for you! But be sure to get to the store early because these savings are only good while supplies last. Be sure to stop by your local Things from Another World to shop our incredible Black Friday Sale, starting at 9 a.m. on Friday, November 27th and continuing through Sunday, November 29th. Unless you have a DeLorean, you won’t have a second chance to get these deals! What is cooler than reading a comic book? Drawing your own, of course! Things From Another World invites our young readers to an art workshop taught by local comic book artists Brian Churilla and Lisa Eisenberg on Saturday, October 17th from 12:00 noon to 3:00 p.m. at the Portland TFAW store. Brian Churilla is a writer and artist, currently drawing Big Trouble in Little China for Boom! Studios and Hellbreak for Oni Press. Brian will introduce young artists to the fundamentals of comic book storytelling. Lisa Eisenberg is a cartoonist, illustrator, and educator, who publishes the I Cut My Hair comic series. She will demonstrate her comic creation techniques during the workshop. This is a free workshop ideal for children ages 8-13 with drawing skills of all levels. All the necessary art supplies will be provided. So come on out and bring your aspiring artists to our art workshop at the Portland TFAW on Saturday, October 17th from 12:00 noon to 3:00 p.m. to explore their curiosity and creativity! Please RSVP on Facebook today to make sure we have enough art supplies for everyone. Things From Another World is thrilled to announce a signing with David Marquez, the artist behind Marvel’s all-new all-different Invincible Iron Man. Be sure to visit the Portland TFAW on Wednesday, October 7th from 7:00 to 10:00 p.m. to purchase the debut issue of this exciting new series and get it signed by David Marquez, while enjoying free beer (for those 21 or older with valid ID) and food! Brian Michael Bendis and David Marquez previously collaborated on Ultimate Comics Spider-Man. Now, they are teaming up for Invincible Iron Man, which finds Tony Stark at a crossroads following the universe-changing events of Secret Wars. This new ongoing series will feature new armor, new villains, and a new love interest. Plus, we get to find out who Tony’s birth parents are! Copies of Invincible Iron Man #1 and other titles featuring the art of David Marquez will be available for purchase at the event. Sketch variants will also be available. Don’t miss out on the opportunity to meet the artist and get the first issue of Invincible Iron Man signed on October 7th at the Portland TFAW! Be sure to RSVP on Facebook today!